Designed to imitate the indulgence of natural goose down this is a man-made, non-allergenic alternative. 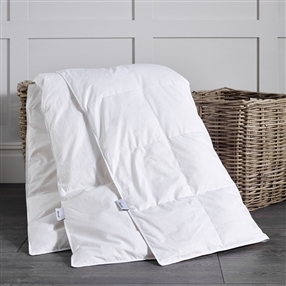 Its high quality fibres match the sought-after insulation of a down duvet with the added benefit of being long-lasting, even withstanding repeat washes. Dacron® Comforel® is a premium branded ball fibre used extensively within the hotel industry. Excellent recovery giving the feeling of natural down while remaining totally hypoallergenic. Quick drying compared to natural fillings. Where is Dacron Comforel used? We use 100% Dacron® Comforel® in all our Dacron filled duvets, pillows and mattress toppers. Each product carries the Dacron® Comforel® label for easy identification of the filling contents. Can you wash Dacron Comforel duvets? Washing instructions are included on the care label found on all products and should be adhered to. All Dacron® Comforel® products must be washed at 40 degrees Celsius or less on a gentle, low agitation cycle. Rapid cycles or ready to wear cycles must not be used as these will damage the product and will launder at too high a temperature. The use of a gentle detergent is required and bleaching agents and conditioners must not be used. DO NOT DRY CLEAN. 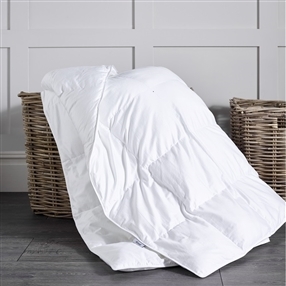 We recommend washing duvets in a laundry machine big enough to allow the item to move freely during the wash and drying cycles, with the drum being no more than 50% full when the item is loaded. We want you to enjoy your dùsal dacron duvet for many years so if you have any further questions regarding your duvet please contact us and we will be more than happy to help.